Bay City administrative offices are located at 301 Washington Avenue, Bay City, MI 48708; phone: 989-894-8168. 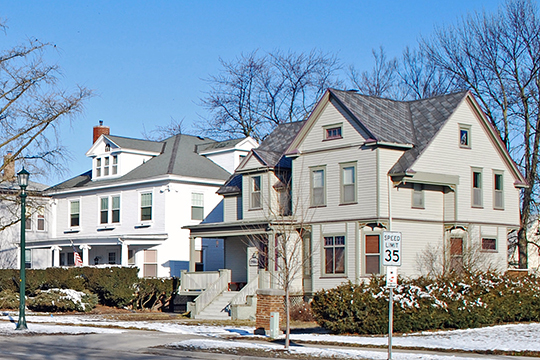 Photo: Homes in the Center Avenue Neighborhood Residential District, Bay City, MI. The Historic District was listed on the National Register of Historic Places in 1982. Photographed by user:Andrew Jameson (own work), 2012, [cc-by-3.0 (creativecommons.org/licenses/by/3.0)], via Wikimedia Commons, accessed April, 2014. Situated on the Saginaw River about 6 miles from its junction with the Saginaw Bay, the city covers a large territory. It has 10 miles of river front and extends back from 2 to 3 miles. It is favorably located for sanitation, the streets being on an average of from 15 to 20 feet above the river surface. The climate is salubrious, and during the hot summer months the temperature is kept at a pleasant stage by cool breezes from the bay. In winter the cold is not severe. The city has been termed the healthiest spot in the State, and certainly all records bear out that assertion. The city was carved out of the wilderness by the sturdy pioneers to whom the American people of the present generation are indebted for the comforts and conveniences they enjoy. As early as 1829, white men traveled through this section, seeking to make peace with the Indians, and unconsciously laying the foundation for the present metropolitan city. Gradually in later years there sprung into existence one of those picturesque frontier settlements, which grew and broadened as the forest disappeared under the stroke of the axe wielded by the pioneers. Substantial buildings too the place of rude log cabins, more people came, and gradually the settlement became a village and then was dignified with the title of town. Within the limits of Bay City today there are factories that are known over the entire world for their products. The woodenware factory of Bousfield & Co. is the largest institution of its kind in the world, turning out annually hundreds of thousands of pails, tuns, etc., and an almost endless variety of woodenware of all kinds. The Industrial Works has few competitors in its lines in this country, manufacturing the heaviest class of railroad work, such as cranes, excavators, wrecking devices, etc., besides many machines, electrically equipped, which are growing in favor with the railroads. The plant of M. Garland turns out a variety of saw mill machinery, and stands ready at any time to furnish a most complete and modern mill. The Michigan Pipe Company has the largest plant in the United States for the making of wooden pipe, and large quantities have been laid in this city and elsewhere for the conveying of water and other liquids underground. A bicycle factory, the National, whose wheels are known wherever wheels are in use, is another important industry. Then there comes two shipyards, one turning out steel vessels that are not equalled for size on the lakes, and another making a specialty of wooden boats that are among the greatest carriers on the inland seas. There are other industries in profusion, embracing nearly every branch of manufacture. The United Alkali Company, of Liverpool England, a corporation with over $40-million of capital, has but recently decided to locate its American factory in Bay City, and its engineers are now at work upon plans for the immense buildings that will be erected. Bay City is admirably situated on the Saginaw River, being practically at the head of deep water navigation. Any boat that floats the Great Lakes can enter the harbor and land with ease at any dock along the many miles of river frontage, thus ensuring competition with the railroads to the markets of the world. During the season of navigation hundreds of vessels enter and clear the local customs office, carrying their varied cargoes to the lake ports, where they are distributed. The railroad connections are the best. Belt lines reach every point along the river front and the outskirts of the city, as well as the central manufacturing districts. Close to the city limits are coal mines, with a large annual output, which are now supplying some of the railroads and many manufacturing plants. The city has many miles of finely-paved streets, straight as the surveyor's lines could make them. They are bordered by handsome shade trees, and in the summer time present an attractive and inviting appearance. The streets are graced with beautiful homes and well-kept lawns add to the general pleasing effect. Although Sears Roebuck and Company is often credited with inventing the mail-order kit house, it was in reality two Bay City brothers who engineered the concept in 1906, offering a house design with pre-cut, numbered pieces. The Aladdin Redi-Cut Homes Company was established in 1906 by William J. Sovereign, a lawyer, and his brother Otto E. Sovereign, a former newspaper reporter, editor, and advertising businessman. C. & J. Gregory Co. and the Bay City Board of Trade, Bay City Illustrated, 1898, Bay City, MI. William and Mary Center for Archaeological Research for Virginia Department of Historic Resources, The Kit House in Southeastern Virginia, 2006, www.dhr.virginia.gov, accessed April, 2014.